The day that the 2014 Academy Awards nominations were announced, many ardent fans of Broadway musicals were seen squinting and shaking their heads. Off they went to type “June” and “Squibb” into Ibdb.com: the Internet Broadway Database. Once her name came up on the screen, smiles and head-nods of acknowledgement followed. Those who have seen Nebraska may not be able to picture Squibb portraying an ecdysiast, to use the more refined term for an entertainer who professionally sheds her clothes. But that role is one that Squibb had played more than a half-century ago. Squibb will look more glamorous than Kate Grant when she attends the 86th Annual Academy Awards at the Dolby Theatre in Los Angeles when the Oscars are dispensed on Sunday, March 2. And she won’t remotely be the only nominee with a Broadway pedigree. Each of the four acting categories includes at least one nominee with some Broadway experience. Perhaps many of them took the advice that two-time Oscar winner Dustin Hoffman always gives to young actors: Perform on stage, the place to learn to act, for you can hear the audience’s response — or the lack of it. Hoffman started in New York theater and then went west after The Graduate had established him; he’s since made five trips to Broadway. His contemporary Bruce Dern, now a best actor nominee for Nebraska, started out on Broadway in 1958 and a year later had a small role in the original production of Sweet Bird of Youth. Meryl Streep did seven Broadway productions in the ’70s before heading to Hollywood and landing 18 Oscar nominations. This year’s comes for playing the drug-addled mother in August: Osage County — which, don’t forget, started out as a play and won both the Tony Award and Pulitzer Prize during its 648-performance stay. This century, Streep has returned twice to the New York stage at the Delacorte, the prestigious summer theatre chummily known as Shakespeare in the Park. Ironically, both times she performed in plays not by the Bard: The Seagull in 2002 and Mother Courage and Her Children in 2007. Streep’s 2013 Oscar competition includes Amy Adams, the con woman in American Hustle; she spent the summer of 2012 in that Shakespeare in the Park theatre for the Sondheim musical Into the Woods. Both will do battle with Dame Judi Dench. Granted, Dench took her time returning to Broadway after her 1959 debut in Twelfth Night. Forty years passed before she came back to town for Amy’s View, which gave her a Tony for best actress in a play. A more arresting fact: When Cabaret first opened in London in 1968, who was playing the madcap Sally Bowles, the role that on film would land an Oscar for Liza Minnelli? Believe it or not, a singin’ and dancin’ Judi Dench. 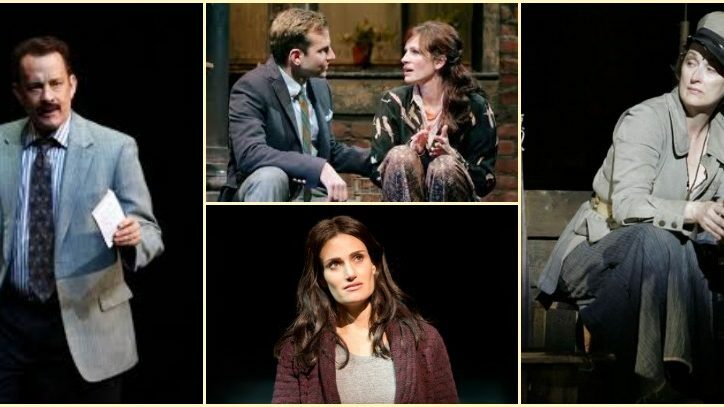 In that best supporting actress race, Squibb’s competition includes two recent visitors to Broadway: Sally Hawkins, the put-upon sister in Blue Jasmine, and Julia Roberts, the far more put-upon daughter in August: Osage County. In 2010, Hawkins starred in a revival of George Bernard Shaw’s Mrs. Warren’s Profession, playing Vivie, who’s heartbroken to find that her mother owns a chain of brothels. Roberts came to New York in 2005 and made a decent Off-Broadway success called Three Days of Rain into a white-hot Broadway ticket. Bradley Cooper costarred with Roberts in Rain, but that’s not all the two have in common: He’s up for a 2014 Oscar too, albeit in the best supporting actor category; he portrayed the wily FBI agent in American Hustle. Broadway will again see him this fall when he plays the title role in a revival of The Elephant Man. And look how many actors with recent Broadway experience were found in this year’s nominees for Best Picture. Captain Phillips starred Tom Hanks as the commander of the MV Maersk Alabama; his previous job garnered him a Tony nomination for portraying columnist Mike McAlary in Lucky Guy in 2012. Dallas Buyers Club offered Jennifer Garner as the conflicted doctor; in 2007, she was Roxane, the beauty loved by Cyrano de Bergerac, played by Kevin Kline. Kyle Chandler, who’s Agent Patrick Denham in Best Picture nominee The Wolf of Wall Street, was on the other side of the law when he played the drifter in a revival of Picnic in 1994. Bryan Batt, the stern Judge Turner in 12 Years a Slave, occasionally played Albin, the premiere female impersonator of La Cage aux Folles, in the 2005 Tony-winning revival. Scarlett Johanson, who plays the voice of Samantha — or Her, if you will, in the film of the same name — won a Tony Award her first time on a Broadway stage for portraying the innocent Catherine in Arthur Miller’s A View From the Bridge. She returned last year to play the far less innocent Maggie in Tennessee Williams’ Cat on a Hot Tin Roof. Ed Harris was merely a voice too, but of Mission Control in Gravity; his body and soul were very much in evidence at the end of 2013 when he appeared in the Off-Broadway play The Jacksonian with his wife, Amy Madigan. During the run, they celebrated their 30th wedding anniversary. At this point, they’re 20 years ahead of Kristen Anderson-Lopez and Robert Lopez, who recently marked their 10th wedding anniversary. But, oh, what a decade it’s been for the husband-and-wife team that gave Best Animated Feature Film Frozen its score. That includes “Let It Go,” their Oscar-nominated Best Original Song. Ten years ago, Mr. Lopez had his first hit — Avenue Q, which racked up six years’ worth of performances on Broadway before it segued to Off-Broadway, where it’s still playing four years later. While cowriting the music and lyrics for that show would seem to be an unsurpassable achievement, Mr. Lopez has apparently eclipsed it by cowriting the book, music, and lyrics for The Book of Mormon, still selling out its Broadway theatre after three solid years. On the Oscar broadcast, “Let It Go” will be sung by Idina Menzel, the Tony Award winner for Wicked. That’s fitting, for she provided the voice of Elsa, who in her kingdom created a winter even worse than the one much of the country is experiencing this year. Two days after Menzel performs at the Oscars, she’ll do the first preview of If/Then, a new musical in which she plays a woman returning to New York to both reclaim part of her old life and complement it with a new one. In a way, Menzel will be doing the same by resuming her career on stage, where she made her first potent appearance as the bisexual performance artist in Rent. Menzel’s voice was joined by four others who have Broadway on their résumés. Kristen Bell, playing Elsa’s sister, Anna, was Becky Thatcher in The Adventures of Tom Sawyer in 2001 and Susanna in The Crucible in 2002. Anna’s confederate, Kristoff, was voiced by Jonathan Groff (Spring Awakening); her intended, Prince Hans, got his vocal cords from Santino Fontana (Rodgers + Hammerstein’s Cinderella). And what would a picture called Frozen be without a snowman? Here he’s Olaf, and he sounds quite a bit like Josh Gad (The Book of Mormon). Those with good memories may recall that Woody Allen, the nominee for best original screenplay for Blue Jasmine, has Broadway experience. Two of his five Broadway outings made it to screen — Don’t Drink the Water and Play It Again, Sam — and now he’s adapted one of his movies into a Broadway musical: Bullets over Broadway begins previews March 11 and officially opens April 10. So a nice synergy continues between Broadway and Hollywood. Even the Academy Awards broadcast itself will be produced by Craig Zadan and Neil Meron, who coproduced the recent Broadway revivals of How to Succeed in Business Without Really Trying and Promises, Promises, and executive-produced the recent smash TV showing of The Sound of Music Live! Zadan and Meron won’t be eligible for Oscars, but if any of the above nominees are summoned to the stage to claim their gold statuettes, do expect some expert acceptance speeches. After all, they all have stage experience.